The Festive Party Cone is headgear in Splatoon 2. It is a 3-star item produced by SquidForce and comes with the primary ability Main Power Up. It can be obtained by visiting the FrostyFest news article on the Nintendo Switch News application. The Festive Party Cone is a conical hat made with a rolled-up piece of thin cardboard decorated with yarn and multicolored LED string lights. 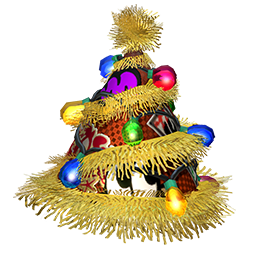 The Festive Party Cone comes with Main Power Up as a main ability. As a 3-star item, the Festive Party Cone has three additional slots for secondary abilities. Since it is made by the SquidForce brand, it has a higher chance of rolling Ink Resistance Up and a lower chance of rolling Ink Saver (Main) to fill its secondary ability slots. An Inkling wearing the Festive Party Cone in the promo image for the FrostyFest gear. An Inkling boy wearing the Festive Party Cone in Inkopolis Square. Two Inklings wearing the Festive Party Cone. Inklings wearing the Festive Party Cone in Blackbelly Skatepark. An Inkling girl wearing the Festive Party Cone in Wahoo World. An Octoling boy with the Festive Party Cone.